There's a new multilingual app about to launch that parents and teachers should know about. 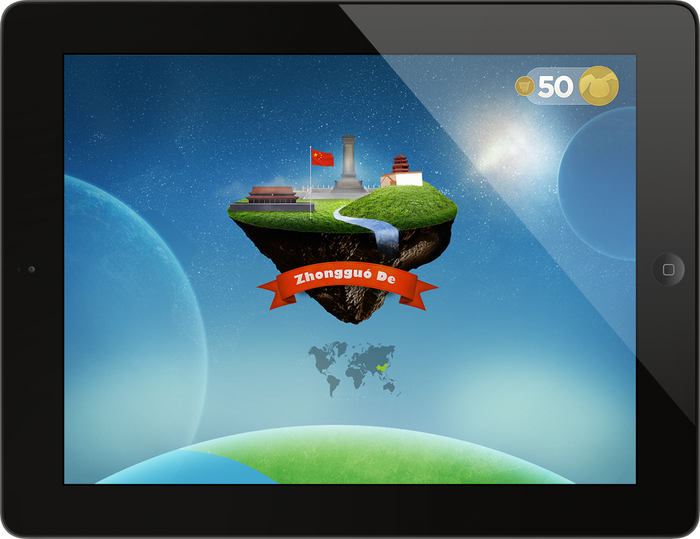 Lingual is an interactive iPad application. The immersion game will be available as a free app possibly as soon as next month. With three language options, Lingual will teach English, Mandarin Chinese, and Spanish through both audio and text. I love that players will also be introduced to geography and culture through various maps and famous landmarks. The application is designed by Tiny Factory, and they are using Kickstarter to help finish funding the last of their project. If you'd like to help them make Lingual a reality, consider becoming a backer. By contributing to this project, you have the option of receiving certain gifts associated with the game, such as flash cards, posters, and a glass copy of artwork found in the app. They've already raised over $4,000 of the $5,000 they need to get funding, so every dollar counts! Lingual is offering one of their beautiful game art works printed in glass and signed by the artist to one MommyMaestra reader. Valued at $80, it is a treasure for any family. This is for the collectors and the language education supporters. You will receive 1 8”x10” game play concept art signed by the artist and printed to glass. Glass print will be of a monument from an English, Mandarin or Spanish journey. To win this giveaway, simply leave a comment at the bottom of this post. 1) Follow Lingual on Twitter (@catchlingual) and send them a tweet between now and Friday, November 9th, 2012. 2) Follow the MommyMaestra FB page. This looks like a great app! I hope they raise the funds to finish it, it's definitely something I would be interested in for my family. Thanks for your comment and support! We are confident we will get the support we need with continued help from the community! Lingual: The Multi-Language Learning Application looks like a great resource. I am always looking for resources to support my students and their Enlish language acquisition. I look for materials that embrace their first language/culture. This app looks like it will do that too. Having a piece of art work in the classroom would be awesome. This looks like a promising app! Hope it gets fully funded! I am looking forward to this app getting funded and being released. The Multi-Language Learning Application seems to be an invaluable teaching tool for my 4 young girls. Will also follow on FB and Twitter. Thank you very much for this amazing giveaway. Can't wait for the app to come out.